There's no doubt that pimples are annoying, but breakouts around the mouth are particularly challenging as that area of skin is very sensitive. A few over-the-counter treatments can help to banish those pesky skin eruptions, but tweaking your daily cleansing habits can keep them at bay for good. Whatever you do, always avoid popping pimples, which can lead to infections, scarring and additional breakouts. Wash your face in the evening with a gentle cleanser containing either benzoyl peroxide or salicylic acid. These acne-fighting ingredients treat existing breakouts and help prevent new ones from forming. 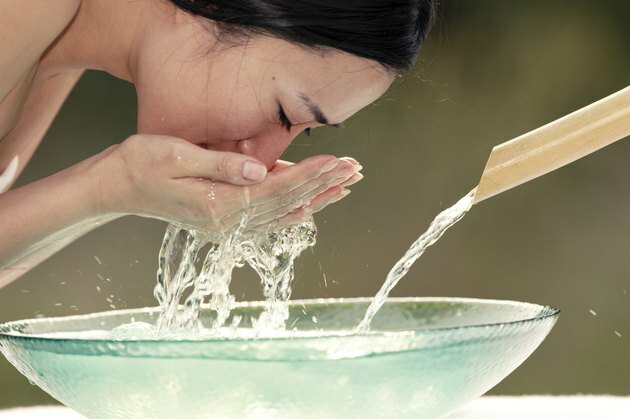 Washing your face also helps to remove any surface oils or bacteria that have accumulated throughout the day. Swipe a toning product over clean skin to tighten pores and prevent dirt and oil from entering. Use an oil-free moisturizer to hydrate your skin and maintain a balanced complexion. Finally, when breakouts around the mouth do occur, spot treat the area as soon as pimples form by dabbing on a product containing benzoyl peroxide or salicylic acid to decrease the lifespan of the breakout. Retinol, a vitamin-A derivative, helps to increase the speed at which your skin cells turn over, thus making it harder for dead skin cells to clog your pores and cause breakouts and inflammation. Apply a very thin layer to your face each night to treat existing pimples, prevent new ones from forming and improve the overall texture of your skin over time. Retinol can be purchased over the counter or more intense varieties are available by prescription. Be sure to consult product labels before choosing a makeup to conceal breakouts around the mouth. Look for a formula labeled oil-free and non-comedogenic, since these products will not clog your pores. Also avoid thick, sticky lip glosses, as these formulas can easily run off your mouth and onto your skin. Remember to wash all makeup off each night. If you have long hair, consider wearing it tied back in a ponytail so that oil from your strands doesn't rub against your face. If maintaining a consistent home skincare routine does not improve the acne near your mouth, consult a dermatologist regarding stronger treatment options. A dermatologist may suggest prescription-strength topical products, antibiotics to reduce inflammation, hormonal treatments, chemical peels or laser therapy. In addition to following a treatment plan, wear an oil-free daily sunscreen with an SPF of 15 or higher, as sun damage can irritate your skin and contribute to the formation of new breakouts.